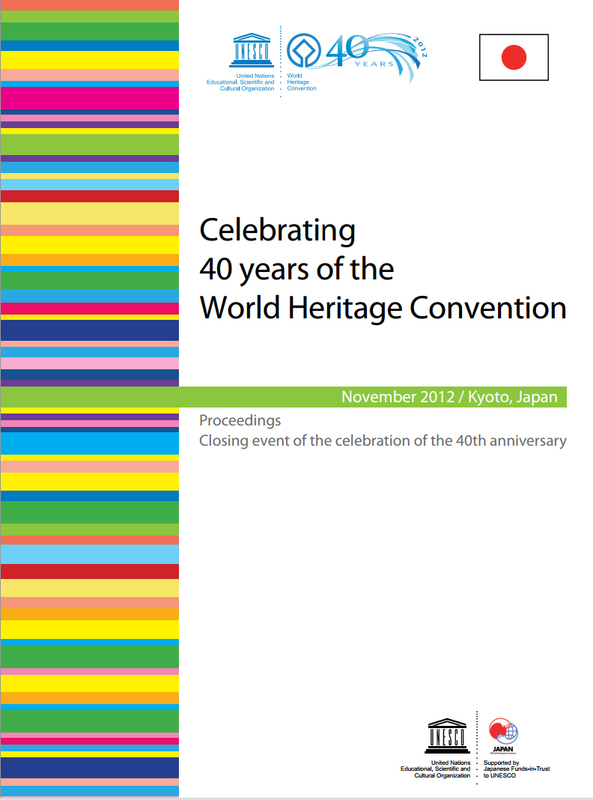 Celebrating 40 years of the World Heritage Convention, the proceedings of Closing Event of the Celebration of the 40th Anniversary of the World Heritage Convention, has been published. This electronic publication provides the vivid record of the three-day landmark event, which was organized jointly by the Government of Japan and UNESCO World Heritage Centre, in Kyoto, Japan, 6-8 November 2012. During the Closing Event, challenges the Convention faced in its early years as well as today's key issues in the World Heritage community, were discussed. Keynote speaker Christina Cameron, Canada Research Chair at the University of Montreal, presented the history and the development of the Convention from the years prior to its adaption to this date, noting its many successes while pointing out recent trends that threaten its credibility. UNESCO Goodwill Ambassador Genshitu Sen, in his commemorative speech, offered a message on the need to share cultural traditions to cultivate peace and mutual respect. Five themes discussed in panel discussions were: how World Heritage community dealt with challenges in its early years; sustainable development and World Heritage; disaster prevention, recovery from disaster with communities; capacity-building and communication, and; engaging the civil society and public and private partnerships. The production of the publication was financed by the Japan Funds-in-Trust. It is available in English and French. the history and the context of the Convention.